Moving to a more plant-based or completely vegan diet can be daunting. More often than not, it’s not as scary and different as you think, and many people are already eating a lots of vegetarian meals anyway without realising it. For me, moving to a predominantly plant based diet was a gradual process. I was able to give up meat and fish overnight, but dairy and eggs took me over a year to phase out (and I do still very occasionally eat these). For others, they decide to go vegan immediately and never look back. Whatever strategy you are adopting, here are some tips I have put together to help you with your transition and ease your fears. Why have you decided to make this change? Is it for your health, the health of the planet or for ethical reasons? Whatever your ‘why’ is, keep that in mind at all times. It’s important to use this as your motivator and remind yourself of why you gave it up, when you are turning down that cheese platter! As I mentioned already, everyone’s journey is different. If phasing animal products out over time is a better strategy for you, then go for it. Don’t be made to feel guilty for slipping up and having a bar of chocolate that contains dairy or forgetting to check the label on that packet of biscuits in the office. This process is about striving for improvement, not perfection! Many people are not open minded to a plant based diet. Vegans are frequently ridiculed and can be subjected to fierce questioning over their food choices (I was once that person wondering where vegans get their protein!). For these reason, along with the prevalence of other fad diet trends, you may have been socially conditioned to believe certain things about vegan diets and nutrition in general. Go into this transition with an open mind and be ready to take on new a perspective on food and nutrition. Plant-based cooking does require more preparation time. 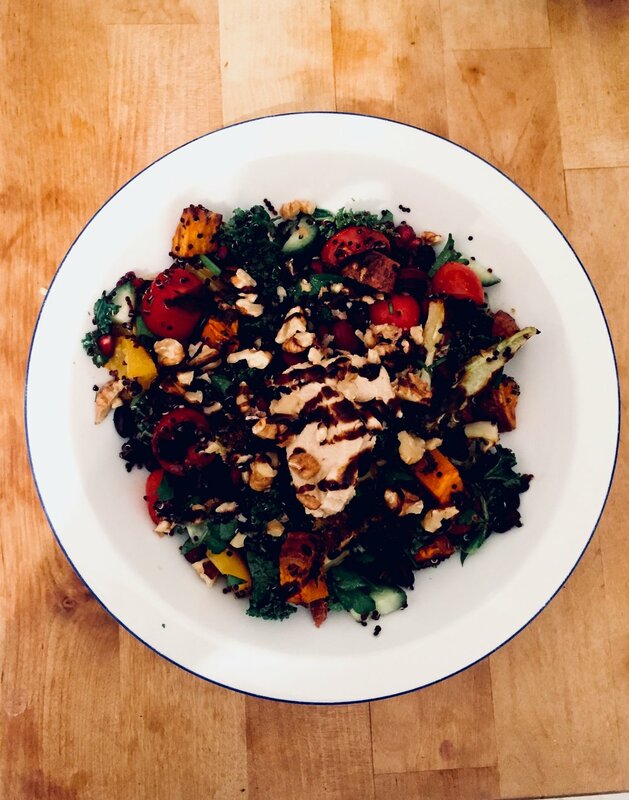 Instead of relying on the traditional meat and two veg, you will have to spend some time planning meals in advance and making sure you incorporate enough of each food group. For me this process was really empowering - I discovered a love for cooking and thoroughly enjoy taking the time to try out new recipes. One tip would be to make things in bulk, so that you can take leftovers for lunch or grab them for dinner another night when you have less time available - Sunday afternoons are the perfect time for this! While there are some great mock products out there, I would say overall it’s not worth spending time and money trying to find alternatives to all your old favourite animal products. Generally they are not great, and can be very expensive. However, there are some exceptions - including vegan yogurt and butter. If you can find someone who is willing to join you on your mission to eat more plants - that’s fantastic! It’s important to feel supported on your journey to plant-based eating. However, it can very often feel like everyone around you is on a completely different page, and this can be discouraging. There are some great communities out there who can provide you with motivation and recipe ideas. Check if you have any local vegan facebook groups, & check out some of these: Living Consciously Crew, How to Vegan, etc. Instead of focusing on the things you feel you are missing out on, focus on all the amazing, healthy and delicious food you are now consuming. Plant-based diets are about abundance, and you can generally eat a lot more in order to make up your daily calories - so enjoy it! Finally, here are some resources to bookmark which will help you make eating plant-based a whole lot easier! Bosh - ridiculously delicious recipe ideas, in video format. The Happy Pear - YouTube channel for quick, easy recipes in video format. Pinterest - your new best friend! I love how you can search for keywords, so if you have a few things in your fridge you need to use up, just enter them into the search bar + vegan and a whole list of recipes will pop up! My list of vegan essentials to stock up on. Cronometer - an online platform which provides a detailed breakdown of your daily nutrition based on inputting what you’ve eaten that day. (WARNING: take with a pinch of salt - some of the RDA’s are not completely accurate, e.g it said I need 120g of protein per day when it’s actually more like half that). Are you taking part in Veganuary? Or maybe you've given up animal products for 2018? If you have any other tips you think I've missed- let me know below!